Welcome to book 3 of the Planetary Anthology: Mars. Three down, 8 more to go. Though I'm starting to wonder if we should at least try listing some of the authors in the description -- they almost never appear in their entirety on the main amazon page. Anyway, the description du jour. Mars, the red planet and our closest neighbor. It has haunted our imaginations for centuries, inspiring tales of heroic deeds and courage. . Mars is also the god of war and the father of fear and panic. 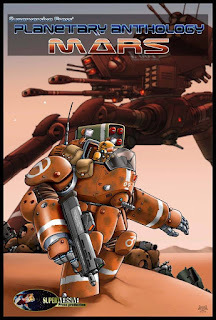 Here are 18 tales of war and adventure set in and around the red planet. Planetary Fiction explores the themes associated with these heavenly bodies as well as their astronomical, mythological, and in some cases even alchemical significance. And of course, New York Times Best Selling author Kevin J. Answerson. And I'm in there too. And of course, the editor is Jon del Arroz, making Science fiction great again, one war at a time. Bring it. Just BRING IT!